With the outdated wallpaper gone and new lights, it was time to add some color. First came the shower curtain. I opted for a gender neutral design. The basic stripes will allow me to change the theme up without having to replace the curtain. You may not be able to tell from the picture below but some of the stripes are opaque. These allow light into the shower area. What we noticed with the previous curtain is no light got past it. With the poor lighting already in the room, you might as well shower with the lights off. Next I headed to the fabric store and picked up one yard of teal and white fabric and 1/4 yard of dark gray. Both of these fabrics are 100% cotton. Please note that I am not a seamstress. I can sew a straight line, but that is about all. 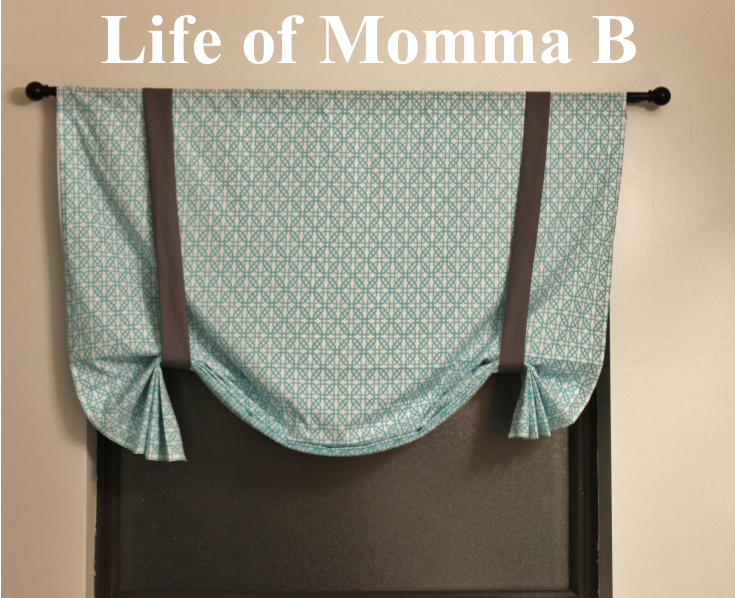 After washing the fabric, I cut and hemmed the large piece to match the width of my window. I added a small pocket at the top for the rod and hemmed the bottom to match the length of the window. Next I cut the dark gray fabric in half length wise. With right sides together I sewed the long edge together. Then I turned it right side out and sewed the ends to make a tube. All that was left was to press and hang the curtains. I folded the bottom up into an accordion, and pressed the pleats so they would stay. Next I added the curtain rod. With the project still laying in my living room floor, I added the dark gray tubes. After hanging the rod onto the wall, I made a few adjustments to the fabric and called it done. The entire window cost me less that $15 including replacing the curtain rod. To go to the beginning of the Bathroom Makeover click here. To go to the next installment of the Bathroom Makeover click here. This entry was posted in Crafts, Home Makeover and tagged bathroom, DIY, sewing, window treatments. Bookmark the permalink.